The fruity tang of orange juice works fantastically well with chilli sauce, creating a sweet and sour effect. 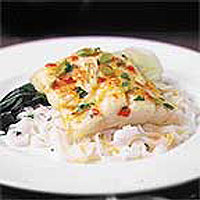 Keep the Oriental theme going by serving the fish with rice noodles and pak choi. Fresh cod is available on the Fish Service Counter, but you can use frozen cod fillets instead. Just defrost thoroughly before use. Preheat the oven to 180°C, gas mark 4. Line a roasting tin with lightly oiled foil. If using a whole fillet, cut the fish into 4 even-sized pieces. Place the cod pieces in the roasting tin and cook in the oven for 5 minutes. Meanwhile, make the glaze by mixing together the orange zest and juice, chilli sauce and salad onions. Season with freshly ground black pepper. Spoon the glaze over the cod and return to the oven for a further 10-12 minutes, or until the cod is just cooked and opaque. Remove from the oven and sprinkle with coriander. Serve with rice noodles or Waitrose Thai Fragrant Rice and steamed pak choi.